“In 1959 a friend of mine saw the great Billie Holiday in a little dive in North Philadelphia about three months before she died. He said she stumbled in obviously quite high carrying her little Chihuahua, Pepi, whom she introduced to the audience. A water glass was kept filled with booze atop the piano for her. One Day Before The Opening of LADY DAY – At Tiffany & Co.
Lanie and I went to Tiffany’s to get a gift for Audra for the opening. Felt like Hepburn in Breakfast at Tiffany’s. But I didn’t eat a bagel in front of the Tiffany window. Nevertheless, felt elegant. Lanie got a silver frame engraved for Audra. A one hundred and one year old woman from Boston came to see the play. She said she saw Billie in Boston many years ago. And she has followed Audra’s career from Julliard to Broadway. She loved the play. Met Lanie for lunch at the Westway Diner on 44th Street. This is the diner that was the original place of the TV show Seinfeld. Many actors eat here. Lanie and I walked down 5th Avenue in time to see President Obama and wife coming into town. Lanie tells me that Mrs. Obama is a good friend of Audra. So, are they going to see Lady Day tonight? We went to Barnes and Noble to see my novel on display: THE PATIENT ECSTASY OF FRAULEIN BRAUN. Yesterday say the Broadway play, All The Way, which is about Lydon Johnson. It was very fascinating with many slides of events in back of the actors. At one point when Johnson wins the election, all kinds of colored paper fluttered down from the ceiling on the audience. People are showing up at the play in ball gowns. Just for the previews. What wonders will they wear on opening! I’d brought along satin slacks, but a tailored top. So I got to go to Macy’s and find a top with rhinestones–and I found it on sale. New York City – Broadway is Going to the Dog — Roxy! Before I left on my travel adventures I wrote Lanie for updates on how things were going as they moved towards the Broadway opening. Roxy was chosen from quite a few professional canines auditioning for the job of Billie Holiday’s dog, Pepe, in LADY DAY. You have failed to tell me how Roxy is doing? Will Roxy be in line for a Tony award? Soon a veggie burger arrives. I munch away writing happily as mustard stains a margin. Who cares? It’s the first draft. I pause to look out the window at five horses nudging each other by a wooden fence. Then I focus back to the page. The writing is always waiting. After five more pages, I lean against the back of my seat. I’ll take a little twenty-minute snooze. I close my eyes, and the last thing I see out the window is a small creek winding through a mass of trees. When I awake, the twenty-minute snooze was forty minutes. Back to the writing. I’m on a roll. The characters are speaking the way I want them to–funny, witty, well…… so it seems at least for now. My dinner reservation is for six, so I stop and go to the shower area. I unpacked clean slacks and a new blue sweater. I shower, change, and proceed to the diner. I’m seated next the woman with the clip board. She says she is going to China and is studying her route. I assume she’s going to New York City to catch a plane at Kennedy Airport. Wrong. She tells me she’s going to take a boat to England. She’s a professor who will be a guest speaker at a Chinese University. When they asked her to lecture there, she stated she did NOT fly. They said: “No problem.” she has been routed across Europe on trains to Russia, then on the Orient Express to China. I playfully ask: “Why don’t you just send a video.” She doesn’t smile, and I wish her happy journeys. Back to the room. I write three or four before we pull in to New York City. 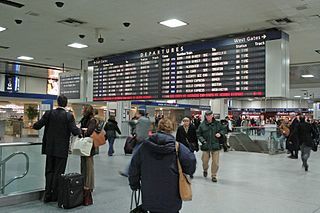 Lanie will meet me at Penn Station and help me with my suitcase. New York City. I’m excited. I hope Lanie’s nerves are under control. I wonder how I can help him. We always find things to laugh at. Laughing is the calming thing.